In the past few years, hipsters have become so ubiquitous in New York City that they have come to define certain neighborhoods: Places like Williamsburg, Bushwick, and Greenpoint are completely associated with hipsters. 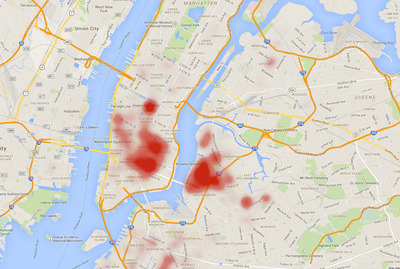 The team at Yelp put together a series of heat maps that show exactly how much hipsters have taken over New York City in the last five years. Their maps, spanning from 2010 to 2014, document how often people mention the word “hipster” in reviews of places around New York City. The maps show that five years ago, hipsters clustered around Williamsburg and the Lower East Side, but today they are basically all over New York City. 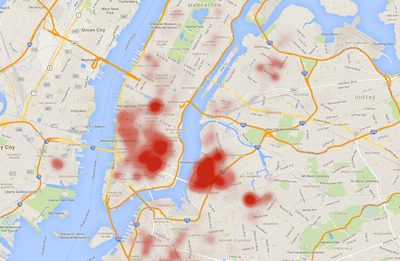 See exactly how hipsters have taken over New York City in the maps below. It should come as no surprise that in 2010 almost all of the hipsters were hanging around Williamsburg and the Lower East Side. A hipster Mecca, Williamsburg is New York City’s gentrification poster child. The LES is a very close runner-up, but most other Manhattan neighborhoods hadn’t been affected. In 2011, hipsters started to expand ever so slightly to different parts of the city, mostly moving further into the depths of Brooklyn. Areas such as Upper Manhattan and Astoria began to see some heat too. New Jersey became a whole lot more hip in 2012, as the heat map shows a sudden spike near Jersey City. Places like Williamsburg and LES were clearly becoming overrun with hipsters, and some hipsters were starting to venture deeper into Brooklyn, to places like Bushwick and Bed-Stuy. 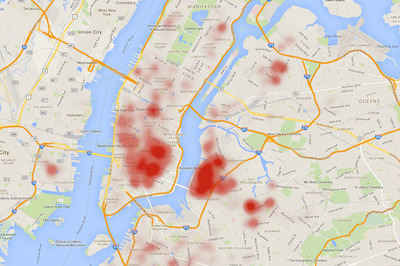 Hipsters also began to move into other parts of Manhattan, like NoMad and the West Village. Due to pricey rents in Williamsburg people began moving even further into areas around Brooklyn. Places such as Bushwick, Bed-Stuy, Crown Heights, Cobble Hill, Boerum Hill, and Park Slope began seeing a lot of heat. Hipsters have taken over all of Manhattan and Brooklyn, and have even started to take hold in Queens and Jersey City. Almost everywhere below 14th Street is totally overrun with hipsters and even posh uptown Manhattan neighborhoods, like the Upper West Side and the Upper East Side, are covered in red. Places like the Lower East Side and Williamsburg are still completely overpopulated with hipsters, which could be why the map shows even more activity deeper into into Brooklyn. To see more words on the heat map, check out the Yelp page here.